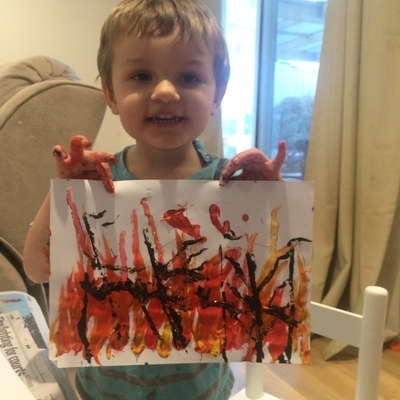 I can remember doing an Australian bushfire painting as a kid in my own art class. 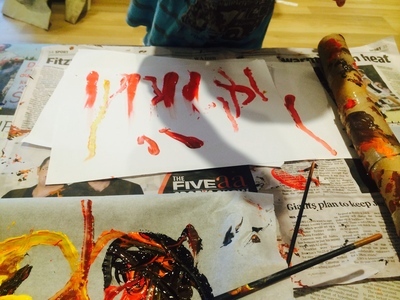 In mine I actually used oil pastels and rubbed them for the fire and black ink for the trees but found using paint was just as effective and a bit easier for my little man. 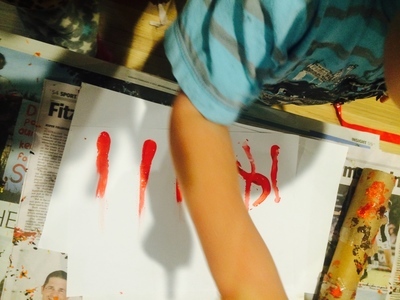 Dip finger into the red paint and so a finger stroke from bottom to halfway up the page. Repeat across the page, spacing approx a finger width apart. Repeat the same step with orange and then yellow paint. It doesn't matter if paint mixes a bit, it makes it more realistic blended. Don't feel you need to redip every line either as the faded look is also effective. 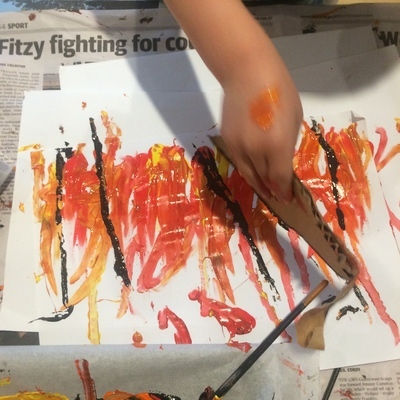 Using the long piece of black card, dip side in black paint and print vertical lines across the page on top of the "fire." As many or as little as you like. Using the shorter card, dip again in black paint and and print on a diagonal to the lines. These create your branches. Don't worry about them being perfect, trees are never symmetrical. Another piece of art worthy of a frame! view all articles by erin.